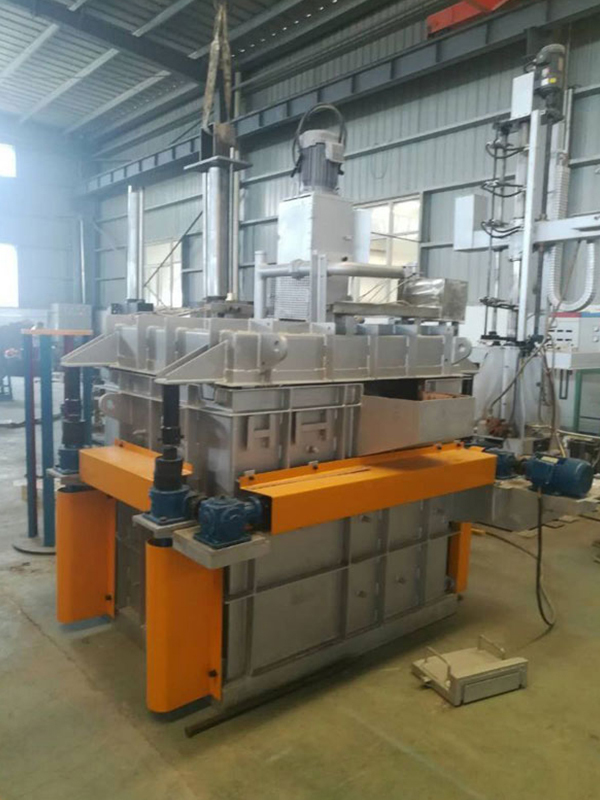 Degassing Box mainly processes molten aluminum containing a certain amount of hydrogen and other residues (alkali metal, slag inclusion), which are removed after being treated by degassing equipment. The principle of on-line degassing equipment is the principle of gas flotation. The process gas (inert gas or a mixture of inert gas and chlorine gas) is injected into the melt through the rotor and broken by the rotor into uniformly dispersed microbubbles, and the microbubbles rise to the melt. Hydrogen is adsorbed into the bubble and excluded. The inclusions are trapped by the bubbles and then rise to the surface of the melt to form dross. The degassing efficiency of Degassing Box is stable at 60% on average, and when the argon-operated aluminum liquid is less than or equal to 1%, the best degassing effect can reach 0.09 cc/100 g.
The inner lining is made of high-silicon melt material. The life of the inner cavity is 2 years on average, up to 3 years. The non-stick aluminum effect is good. It has no pollution to the aluminum melt. The inner design has a baffle to ensure the stability of the aluminum melt surface. It can prevent the oxides on the surface of air and aluminum melt from being wound into the aluminum melt, and bubbles or residues flow out. It is made of silicon nitride and has a service life of more than 2 years (the longest service life can be 5 years). It has strong resistance to aluminum corrosion resistance, thermal shock resistance, oxidation resistance, wear resistance and mechanical strength. Superiority, long-term immersion and no wear, using 60mm pole and 200mm head diameter, can minimize the stirring resistance to the melt; high speed 450~550 rev / min design can break the bubble to the maximum extent And the largest range of bubbles will be diffused to all corners of the cavity, there will be no change in performance, with long-term stable degassing effect; (stability of degassing efficiency, service life, labor cost of replacing the rotor, etc.) The overall cost performance is the best. It adopts silicon nitride material and has an average service life of 1 year and up to 2 years. The heating efficiency is high, and the oxidation of the surface of the aluminum melt is reduced, and the slag is not polluted by aluminum water. The degassing device can be used with a mixture of argon, nitrogen and chlorine as an option, and it is safe to use argon and chlorine protection measures. The sealing structure of the on-line degassing device is designed to completely prevent the slag generated by the secondary oxidation of the aluminum melt by the cover design of the tank cover, the box body, and the aluminum melt port, and effectively improves the degassing effect.